Kind of Blue by Miles Davis. For Bass, Drums, Piano, Tenor Saxophone, Trumpet, Alto Saxophone. Hal Leonard Transcribed Scores. Jazz. Difficulty: medium-difficult. Full score songbook. Chord names, full score notation and introductory text. 63 pages. 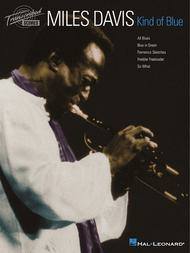 Published by Hal Leonard (HL.672460).ISBN 0634011693. With chord names, full score notation and introductory text. Jazz. 9x12 inches.Regarded by experts as 'the best jazz recording of all time,' the 1959 release Kind of Blue is one of the most influential albums in the history of jazz. This exceptional book features transcriptions of all the improvised solos as well as sketch scores for all the songs from this landmark release. This includes Miles' trumpet parts, the brilliant sax work of John Coltrane and Cannonball Adderly, and rhythm section parts to use as guides for the feel of each composition. Songs include So What, Freddie Freeloader, Blue in Green and more. Also includes background information on the album and notes on the folio. Essential for all jazz fans!About Hal Leonard Transcribed ScoresTranscribed Scores are vocal and instrumental arrangements of music from some of the greatest groups in music. These excellent publications feature transcribed parts for lead vocals, backup vocals, lead guitar, rhythm guitar, bass, drums, and all of the various instruments used in each specific recording session. All songs are arranged exactly the way the artists recorded them.